Small, lightweight and portable, the Go Power!™ GP-300 modified sine wave inverter is an easy solution for small power loads. Just plug it into your vehicle's lighter socket, and its ready to go. 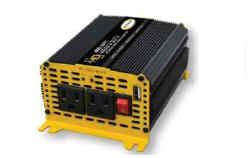 Use the Go Power!™ GP-300 to power lights, TV, computer, or recharge cameras, cell phones and more.